Ayurveda is considered by many scholars to be the oldest healing science. In Sanskrit, Ayurveda means “The Science of Life.” Ayurvedic knowledge originated in India more than 7,000 years ago and is often called the “Mother of All Healing.” It stems from the ancient Vedic culture and was taught for many thousands of years in an oral tradition from accomplished masters to their disciples. Some of this knowledge was set to print a few thousand years ago, but much of it is inaccessible. The three oldest Samhitas are Charak Samhita, Sushrut Samhita, and Ashtang Hridaya Samhita. 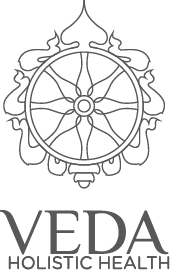 Ayurveda is the science of life based on the Vedas, the Hindu books of knowledge and wisdom. More than five thousand years old, Ayurveda is perhaps the most complete system of living. Not only does it embrace medicine, but also philosophy, psychology, lifestyle, and health. Ayurveda is based on the idea that the universe is composed of five basic elements: Space, Air, Fire, Water, and Earth. These five elements combine to form the three vital energies called the doshas. The mix of the three doshas in each of us, determines our physical constitution (body type) called prakriti. In addition to the three doshas, we are also affected by the three psychic forces called the gunas. The mood of goodness, passion and ignorance. The most basic idea of Ayurveda is the concept of balance. We are healthy and happy when our doshas and our gunas are properly working in harmony. Most disease results from an imbalance of our doshas. To heal disease, the Ayurvedic practitioner advises or administers various treatments to restore the being back to its innate nature. Then the balanced body can heal itself. In essence, Ayurveda is a system that uses the body’s own defenses to restore and maintain health and happiness. The principles of many of the natural healing systems that are popular in the West have their roots in Ayurveda, including Homeopathy and Polarity Therapy.